After 15-years of practicing Classical Ashtanga Vinyasa Yoga, as blessed by his late Guru, Sri. K. Pattabhi Jois, Gannon experienced the natural process of where tradition often leads other long-term yoga teachers. And that is evolution and freedom. The freedom to adapt what our own experience on the mat has lead us to discover and create for ourselves. 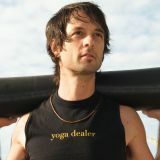 Challenge yourself to a powerful, vinyasa based practice that is not for the narrow minded and not for the weak. Always with the stimulating, rocking playlist that has becomes Gannon's driver of a high-energy practice. And, now you can learn to teach this same practice! It is this same practice style that Michael Gannon has been teaching regularly at Yogaloft Playa del Carmen, since the yoga school opened in 2013. These GPVY Teacher Trainings are new Gannon developed teacher training that are pre-registered with Yoga Alliance worldwide, LAIYLA Mexico and Yoga Alliance UK. NOTE: You do not need to take both trainings. BOOK NOW your GPVY 100 Certification Teacher Training!